← Photo(s) of the Week: A Victoria Drive By in Canada. The Autumn Leaves Up Close in Michigan. It’s Autumn in Pure Michigan. Corn mazes are forming, apple cider is pouring, college football is in full swing and the transition from summer to winter has begun in earnest. Autumn in Michigan also brings the changing and falling of the leaves. While out-and-about in Ann Arbor, Detroit and Grand Rapids and the surrounding areas, I’ve had the chance to see the leaves of Autumn up close. Why not start out with the best of the best. I came across this tree randomly while driving around the small-town of Rochester. The bright orange and other colors caused to me to get out of the car and just walk back-and-forth, park underneath and enjoy what this time of year brings. Two skylines, two cities, two countries, the open water and Autumn straight ahead on Belle Isle in the Detroit River. Not bad! Hello Windsor, Ontario, Canada and Detroit, Michigan, United States! On another part of Belle Isle I came across the unique trio of Autumn, beach and skyline. Some Autumn joy was to found in Michigan’s second biggest-city, Grand Rapids, too along the Grand River opposite the skyline. The colorful leaves and the open water formed a relaxing duo. Unfortunately the leaves can’t stay on the trees forever. After a short time and/or a gust of wind they make their way to the ground. Their beauty doesn’t disappear right away though. I felt like a kid, ready to just jump in any pile I came across. On grass that is. More beauty of the season. I’ll let the pictures speak for themselves. Winter and cold weather may be coming, the warm air of summer may be in the rear view mirror, but to see the Autumn leaves up close in Michigan, that’s a great price to pay. Where have you come across Autumn beauty in your travels? Do you have the chance to experience the changing of the seasons where you live? This entry was posted in day trip, Detroit, Grand Rapids, Michigan, Road Trip, travel and tagged Ann Arbor, Autumn, day trip, Detroit, fall colors, fall leaves, Grand Rapids, Michigan, Pure Michigan, road trip. Bookmark the permalink. Seems like it has been a late season for fall foliage this year. I am going hiking in Kentucky next weekend, so I hope I timed it right, but I might be a bit early. 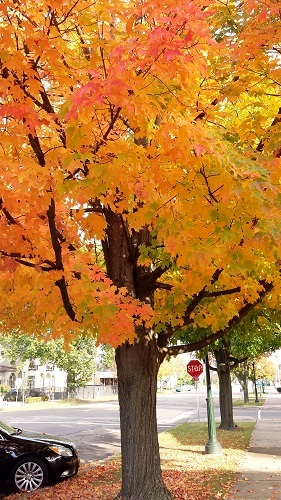 Great pics of fall color in Michigan. I agree Ted. Peak is just approaching here in southeastern Michigan, with some trees still unchanged. The cold overnight temps over the last week have helped speed things up though. Thanks, it’s a favorite time of the year to grab pics. Hope there is some frost and below freezing nights down there before you go. Great colors. I think I missed it in Chicago. I went out early (October 14th or so) but have been out of town the past two weekends. I’m afraid next weekend when I’m finally at home the colors and leaves will be gone.